Experts suggest a healthy colon cleanse 2x per year! Our Core Cleanse program was designed to allow for the digestion of lingering food particles that adhere to the intestinal wall and colon which bacteria and yeast thrive on. It is estimated that the human body can hold up to 5-25 pounds of this “build up” which can be seen by an inflamed protruding belly. So not only will bacteria and yeast be reduced but also the inflammation that follows with an unhealthy gut. 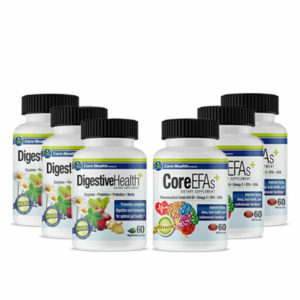 Utilizing a combination of Digestive Health and Core EFA’s, your GI tract will be cleansed of harmful pathogens, replenished with broad spectrum digestive enzymes and rebuilt with pH stabilized probiotics and the proper prebiotics to allow for continued growth and colonization of the “good” bacteria. To maintain a healthy gut year round, doctors and experts have recommended a cleanse program to be utilized twice a year. With our specific protocol and recipes, you will not only be able cleanse the body but also replenish and bring balance back to your eco-system.